Whether it’s at a trade show or conference, you want to make the most of the space you have available. 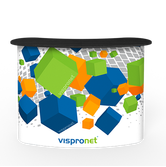 Vispronet's Trade Show Table Covers product line allows you to turn boring trade show tables into traffic stoppers. Our Table Throws line is available with full and logo prints, so you’ll be able to print exactly what you want on your custom table cover at a great price. Choose between standard and fitted (which provides a definite shape) Table Coverings in round and rectangular configurations. You’ll also have the option to select from a white table cover or choose to compliment your design by printing it on a colored table throw (15 stock colors available). If your company is looking to better promote its brand awareness, getting a custom tablecloth is a must. A well-dressed table is the perfect place for your company to engage with its customers, whether that engagement consists of giveaways, handouts, samples, or other kinds of promotional merchandise. When it comes to promoting your company and its products, don’t waste money on a lackluster, cheap, trade show table covers – consider turning your table into premium-quality advertising space with a custom table throw from Vispronet®. 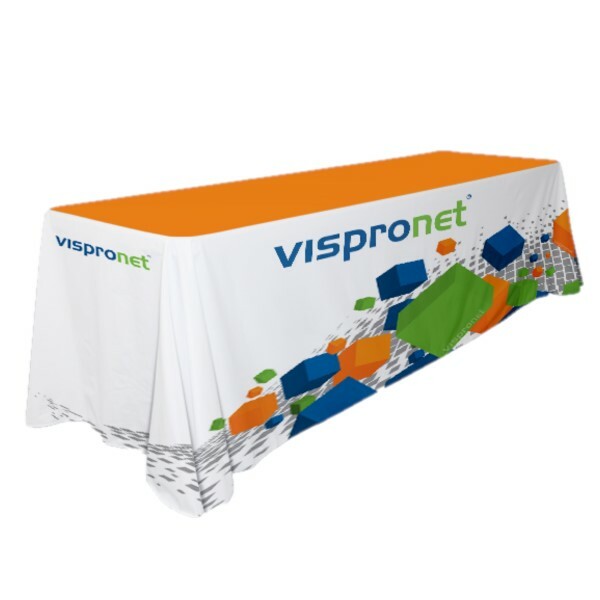 Whether it’s a trade show, job fair or other event, Vispronet® carries custom promotional tablecloths for every setting under the sun. We have dozens of styles, so there are table covers available for every use imaginable. For more information on how to set up one of our custom table throws, or to see how to steam out wrinkles in the fabric, check out the video below. Vispronet®’s single-color trade show tablecloths are an economical choice for those customers looking to create a cohesive display without breaking the bank. Whether you want a blue, black, red or white table cover, our stock color table cloths are a quality alternative to custom-printed table throws at a bargain price. Our full-print and trade show table covers with logo print give you the ability to completely design your tablecloth from the ground up. If you need a simple way to brand your company at your next event or trade show, look no further than our full or logo print personalized table cloths. Our convertible tradeshow table covers let you convert your table cover from 8 feet down to 6 feet or 6 feet down to four feet, giving you the flexibility you need to handle any size of display. Whether it’s our flagship full-print table cover or a branded tablecloth with a logo print, our hook-and-loop adhesive tape makes the size conversion happen simply and easily – perfect for helping you get your company out there no matter the event. Each fitted tablecloth firmly fits your table and provides a definite shape, while the stretch tablecloth gives you the ability to fit your table cover to the table. Both the fitted and stretch tablecloth are available in two configurations: the full throw covers the entire table with a zipper at the back, while the economy throw covers all but the back. Our crossover line features two complimentary designed table throws positioned on top of each other to form a stunning, modern look. Each crossover table cover is available in one of three sizes: 4 foot, 6 foot and an 8 foot tablecloth, with your custom design printed on each. Printed on either our Polystretch or Sundeco material, our stain-resistant table throws make embarrassing spills and unsightly marks a thing of the past. When a spill happens, all you need to do is wipe away the mess – there’s no dampness left behind at all. Choose which material better suites your event; Polystretch is a soft, stretchy polyester fabric, compared to Sundeco, which is a vinyl-like fabric for your stain resistant table cover. A custom or colored table throw is a great way to bring customer attention to your trade show booth or event table, but pairing it with one of our custom table runners is a surefire way to maximize the attention your table receives. Using a table runner emblazoned with your logo or printed with your design helps customers notice your brand and marketing message. Our custom table runners are offered in a number of styles, including full print, white with logo print and colored with logo print. Economy vs Full Coverage: Which is Right for You? We have two different coverage options available, depending on your needs. Our economy coverage option covers the front and sides of your custom tablecloth to leave the back open (perfect for storage), while the full coverage option covers everything – front, back and both sides. Full coverage promotional tablecloths feature full length panels on all four sides. Economy coverage table covers feature an open back, ideal for seating and storage access. Full coverage is great if you’re in a location where your table cover is going to be viewed from 360°, such as school functions or weddings. On the other hand, the economy coverage option allows you to store things underneath the table itself so that you have easy access when it comes time to go to the trade show. Our round table cloths are offered in a variety of styles and choices to better help bring customer attention to your brand message. Not only do we offer our flagship custom full printing service, but we also offer logo prints accentuated with a variety of background colors. Our round table cloths can cover table diameters ranging from as low as 32” to as high as 96” and everything in between. Each table cover is printed on our flame-retardant 100-percent polyester fabric, which offers a slight stretch to prevent wrinkles. We also offer a stain-resistant fabric for customers in high-spill environments like food shows. If you spill something, just wipe away the mess. Getting a good advertising presence means not only maximizing your use of the space of your table, but also the space on top of your trade show table cover. Vispronet’s line of advertising table displays and banners help you do just that, maximizing your use of every inch of available space. Every inch of your message, brand or logo is custom-printed on our high-quality fabric, so you can subtly promote using a miniature banner or flag or create a prominent table display to be the centerpiece of your next trade show booth. Our portable displays and banners come in a variety of sizes and styles, including portable booths, backdrop banners, header banners, and mini banners. Our portable booth banners range in size from 2.5 feet by 2.5 feet to 7.4 feet by 5 feet, so you can find the banner size you need to fit whichever table you use. No matter what your budget or how big your business, Vispronet® offers you the options to fit your table cover needs. From trade shows to business fairs and beyond, Vispronet® has table covers to fit any setting. 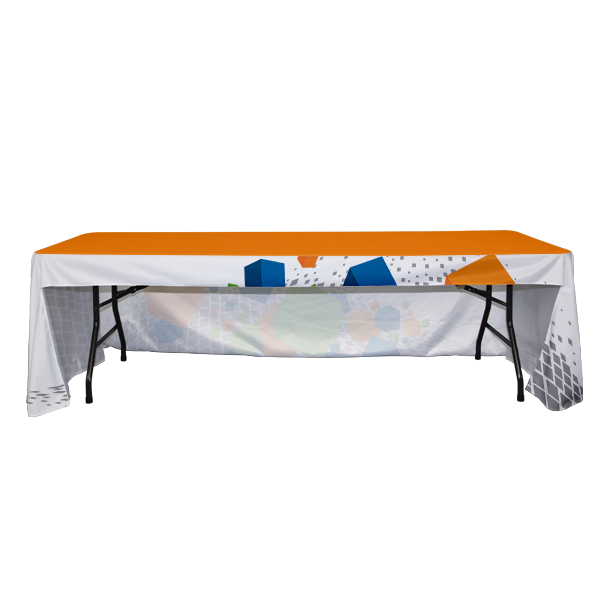 Whether it’s one of our solid-color stock table covers, our company tablecloths with logos, or our custom full-print designs, all of our table covers are made of flame-retardant, 100-percent polyester fabric, with hemmed sides for a nice, finished look. If you’re looking to boost your company’s brand awareness and better engage with your customers, consider a table cover from Vispronet® today.